The supply chain of the health sector – the manufacturing, distribution, procurement and consumption of medical supplies – has severely lagged other supply chains in terms of efficiency, innovation and technologies. Supply expenses generally constitute about 15 percent of total hospital expenditure. Though this is dwarfed by payroll’s 50 percent (or higher) share of expenditure, supply expenses are the second largest cost category and present far greater opportunities for decreasing expenses and increasing resource efficiency. 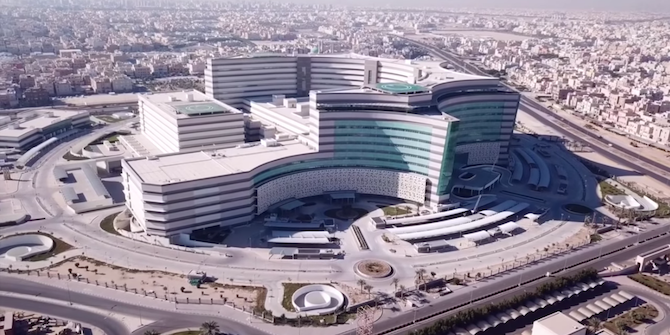 In Kuwait’s public health sector, an estimated 327 million KWD (£821 million) is spent on medical supplies, according to the Ministry of Health’s Annual Health Report for 2015. Pharmaceuticals account for almost 60 percent of this spend. In this segment, Kuwait misses a multi-million-dollar cost-saving opportunity every year: generic drugs substitution. Generic drugs are clinically-identical alternatives to branded drugs that enter the market after the patents on their branded counterparts expire. Although generic drugs are 50 to 80 percent cheaper, they generally exhibit equal efficacy, safety, and quality. Generics are cheaper as manufacturers do not have to factor the cost of research, development and marketing into the drug’s price. Unlike ‘copycats’ in other industries, where such a practice is usually illegal and carries a perception of lower quality products, governments encourage dispensing generic medication over their branded counterparts. Even the brand-name companies stand to profit from the generic drug market and, in fact, produce about 50 percent of generic drugs. In most mature healthcare systems, generics account for a significant portion of drug prescriptions. For example, in the United Kingdom, 81 percent of drugs are generically dispensed. In the United States, 89 percent of dispensed drugs (US$3.9 billion) were generics. On the other hand, generic drugs account for only 21.6 percent of total volume (and only 12 percent in terms of sales value) of prescribed drugs in Kuwait, according to a 2016 report. Kuwait’s peers, the Gulf Cooperation Council (GCC) countries, show similar rates of generic drug penetration in the pharmaceuticals market. For example, in Saudi Arabia and the United Arab Emirates, approximately 16 percent and 19 percent of drug dispenses were for generics, respectively. It seems that the allure of international brands in the GCC is not limited to apparel, shoes and accessories. Let us assume generic drugs dispensing volume in Kuwait increases to 50 percent and that generics are, on average, half the cost of their branded counterparts. Based on Kuwait’s current spending patterns on pharmaceuticals, it can save roughly 30 million KWD (about US$100 million) annually without any capital investments or negative implications to healthcare quality if these assumptions can be met. And this is only a conservative estimate about how much can be saved via generic substitution. To demonstrate the cost saving potential of generic substitution at the item-level, let us consider Prilosec: the original patented brand of omeprazole, a drug prescribed to manage stomach acid and developed by the UK-based pharmaceutical company AstraZeneca. In the United States, each box sold for $3.27 before its patent expired in 2002. Today, the generic version of Prilosec sells for $0.08. The most common brands of omeprazole prescribed in Kuwait – Gasec and Losec – also happen to be twice as expensive as some equivalent alternatives. Similarly, there are over ten different brand names of paracetamol registered in Kuwait. Paracetamol is a drug used to treat mild pain and is more widely recognised as either Panadol or Tylenol. From a clinical perspective, these two products (and their generic counterparts) are identical. * Official wholesale prices retrieved from Kuwait’s MOH – Registration & Control Administration - 2018 Drug Price List. With significant price mark-ups, how do brand drugs continue to sell long after their patents expire? The short answer: Pharmaceutical corporations exploit multiple supply chain and marketing tactics to maintain the profitability of their products long after patents expire. A few of these tactics are discussed below. To encourage expensive research investments in new drugs and treatments, governments grant exclusive selling rights to manufacturers of new drugs for periods that can last for 20 years. Exclusivity during the patent period, mixed with large investments in marketing and advertising over many years, induces strong brand recognition and loyalty – equally so among patients, pharmacists and physicians. Public health systems and institutions don’t buy single products from suppliers but enter into multi-year contracts for numerous different products. Not all products in a trusted supplier’s purchase order will be optimally priced. Supply chain alliances must consider product costs as well as supplier reliability and reputation. For example, what is the manufacturer’s historical product defect rate? Can a local manufacturer of a generic drug produce and deliver the quantities needed consistently? Can a local manufacturer respond to demand or supply shocks as effectively as GlaxoSmithKline or Pfizer? In addition, suppliers often build strong relationships directly with physicians, getting them to ‘pull’ the products down the supply chain. Brand products invest much more in their packaging and marketing. But does packaging make such a difference? Consider bottled water manufacturers, who have mastered the art and science of packaging. They all sell a virtually identical product: clean water. Never mind all the misleading (and largely unscientific) claims that some brands make about their product’s ‘rejuvenating’ properties or the ‘natural’ source of their water. Forty percent of bottled water is plain tap water packaged more appealingly. Yet, dozens of successful bottled water brands continue to thrive and demand a wide range of prices. I digress. Packaging matters. Branded drugs attempt to maintain a lead over generics by ‘re-inventing’ their out-of-patent drugs to signal novelty and/or apply for a new patent. Earlier, I mentioned ten different paracetamol brands registered in Kuwait. Across these brands, there are over 100 registered strength-form versions and minor variations of paracetamol. An example: Panadol Advance and Panadol Extra Advance both have 500mg of paracetamol per tablet. Added to the Panadol Extra tablet is just 65mg of caffeine per tablet. For reference, the average coffee cup has about 100mg of caffeine. The ‘Extra’ in Panadol Extra Advance adds an additional 46 percent to the price. Policy makers have the largest role to play. The Ministry of Heath should actively pursue the wider adoption of generic drugs in the healthcare system. While the Ministry of Health publishes the official prices of all drugs registered in Kuwait, this alone does not incentivise physicians and pharmacists to change their prescription habits in Kuwait’s ‘all-expenses-paid’ healthcare system. Creating price transparency and awareness regarding drug prices is only a first step. More policies that push for product standardisation and price ceilings on hospital supply inventories are necessary. The United Arab Emirates recently took an important step towards dispensing generic drugs. The Department of Health (DoH) mandated that pharmacies at health facilities dispense generic medicines (where one is available), effective 1 September 2018. Patients retain the option to procure the branded version but need to pay (out-of-pocket) the price difference between the branded product and a reference price published by the DoH. This strategy may well increase cost awareness as patients confront stark price differences when comparing alternatives. Physicians are the gatekeepers of pharmaceutical drugs, being the ones who select the drugs for the patients to consume. While physicians receive ample training regarding the clinical properties of prescription drugs, they have little awareness about the costs and the supply chain implications of their decisions. At a minimum, physicians should stay in touch with the changing pharmaceuticals landscape, as brand drugs lose patent protection and new alternatives emerge. This information may be sought from pharmacists, smartphone apps, or hospital procurement specialists. While patients have little control over their prescriptions, they should be better informed about the clinical equivalency of generic drug alternatives. False perceptions about a generic drug’s inferior quality due to lower price and lack of recognisable brand name need to be overcome. Perhaps it ought to be a physician’s responsibility to educate their patients about the viability of generic drugs. Unfortunately, a recent study shows that pharmacists and physicians in Kuwait hold the same sceptical views as the general public, with less than half of surveyed respondents believing that generics are as effective as brand drugs. Mature healthcare systems have long since controlled the costs of drug spending by shifting more volume toward generic drugs. Their current efforts are aimed towards a similar opportunity in the medical devices supply chain, but one that presents a far greater challenge. It takes much more research and evidence to establish clinical equivalency of medical device alternatives (stents, in the field of cardiology, present an interesting case study), and price transparency has been much harder to establish in the medical devices industry. For Kuwait and the GCC countries, these opportunities and challenges are far off the horizon, as generic substitution currently presents a far simpler opportunity that has yet to be exploited. Yousef Abdulsalam is an Assistant Professor at Kuwait University’s College of Business Administration in the Information Systems and Operations Management Department. In 2018 he was a Visiting Fellow at the Middle East Centre, where his research investigated the health sector supply chain of Kuwait.